Don’t you just love book reviews? I do! Somebody has taken the trouble of finding a great book, reading it is now trying to explain to me why it would be good for me to read it too. I feel totally spoiled! It’s time I returned the favour! 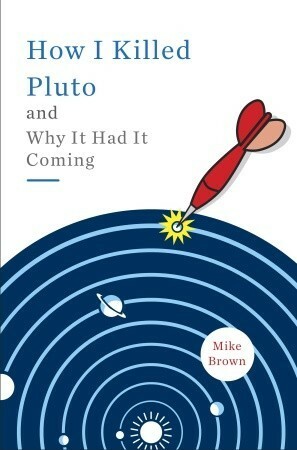 Let me introduce the book called “How I killed Pluto and why it had it coming” written by an American astronomer Mike Brown. Yes, the very guy who discovered several objects (later called dwarf planets) on the outskirt of the Solar System and is therefore responsible for Pluto’s being kicked out of the planet family! Dr. Brown is a professor of planetary astronomy who works in the California Institute of Technology. He is well-known among astronomers and non-astronomers alike for his search of the distant objects of the Solar System. An asteroid discovered in 1998 was named in Dr Brown’s honour. “11714 Mikebrown” is a stony asteroid about 4.5 km across that orbits the Sun in the central part of the Asteroid Belt once every 4 years and 4 months. His book, published in 2010, is a memoir in which Brown describes his work and personal life in years following his PhD, his discovery of the objects that he called Xena, Santa and Easter Bunny (later he, as a discoverer, was allowed to choose official names for these objects, and we know them as dwarf planets Eris, Haumea and Makemake) and some of their moons, as well as events of the famous “planet vote” in Prague in 2006 when astronomers determined the definition of the word “planet” and made Pluto a Dwarf planet. The book gives us a good insight of what it’s like to be an astronomer and an observer. I personally was always wondering what do those guys actually do apart from consuming more coffee than the rest of the world (since they work at night). Turns out there is the same fierce competition, juggling work and family life, occasional questioning oneself “should I carry on” and “Am I fit for the job” as in many other professions. Well…with an occasional chance to spot a planet-like-never-seen-before object or two! The book also explains that a picture of the world with planet Pluto in it was simply wrong and it was absolutely necessary to reclassify it (although the author thinks that a term “dwarf planet” is a very poor choice of words). The book is overall a great read, funny, catchy and hugely informative. You will be looking at the sky with the different eyes after reading it! By the way, in the beginning of 2016 Mike Brown (in collaboration with his Caltech colleague Konstantin Batygin) shook the scientific community once again by proposing the existence of the Planet 9! The two scientists suggested the presence of a new planet as an attempt to explain the strange orbits of some of most distant icy objects of the Kuiper Belt, the region of the Solar System beyond Neptune. They’ve run a numerous computer simulations to determine what parameters (like orbit and size) the planet might have to influence the small icy bodies in a way that they observed. They determined that Planet 9 should be about 10 times heavier than our Earth and orbit the Sun 20 times further than Neptune! To confirm the planet exists, scientists have to do one final step: spot the planet itself! Is Dr Brown about to reshape the Solar System again?